Stress is something we have all experienced, from meeting deadlines at school or work to driving a car in busy traffic. Normally, a small amount of stress can actually put our bodies at an advantage because it increases our focus and alertness within a given situation. It can also actually help us to get out of dangerous situations. However, in larger doses stress can be extremely detrimental to our health and well being both physically and mentally. So if you are feeling the effects of being stressed right now, then taking some steps to combat it and reduce your stress levels will help you to improve all aspects of your overall health and state of mind. When we are stressed, our nervous system secretes the stress hormone which is called cortisol, into our bloodstream. Adrenaline is another hormone which is released and contributes to our sense of panic and increases our heart rate, but cortisol is the key hormone involved. You can feel a sense of looming dread, an elevated awareness to your surroundings, an increase in heart rate and a rise in blood pressure, as well as being unable to control your breathing, as your body becomes more tense and your muscles tighten up. Stress is more common today than ever. With our busy lives, we can all struggle sometimes to stay calm and in control of our emotions. Naturally, this can lead to a stressful outcome. An increase in stress levels can be detrimental to our health as it can lead to all manner of complications such as heart conditions and a reduction in our quality of mental health. Therefore we need to act, and now! Reducing stress can be easily achieved once you know the tools and tricks to do so. Below are some of the top ways in which you can achieve a calmer and more relaxing existence. Eight hours a night of sleep is recommended, but this can vary with your age and other factors such as your state of health. Some of us are clearly having too little sleep. Try to listen to your body and get into a healthy routine in the evenings before going to bed. For example, gradually go to sleep fifteen minutes earlier than you usually would on a Monday, and then a few nights later, go to sleep thirty minutes earlier than this. You will gradually feel the benefits and by doing this slowly and through listening and reacting to your body, you can reach your optimum level of sleep required. Of course this is much easier said than done, and it is only on an individual basis that you can implement and judge the results. Regular exercise will release endorphins to your brain and other ‘feel good’ hormones such as serotonin. Interestingly, serotonin is also present in chocolate (which is arguably one of the reasons it is so widely enjoyed), and in eggs. Chewing gum is also argued to reduce cortisol levels. Reducing your caffeine intake can help too as caffeine can have a negative effect by raising your blood pressure which can of course lead to more stress. A diet containing plenty of fresh fruit and vegetables will help your body get the vital nutrients it needs to function at its optimum capacity, so at least in this way you can exert some control over a possible reduction in your stress levels. When you are relaxed, your blood pressure will go down, your heart rate will slow, your breathing will flow in an easier manner and you will generally feel happier. This is the state stressed people are longing for and there are ways out there to achieve it. Firstly, work on your breathing and allow time for yourself. This may mean going for a walk and taking in the fresh air, or having a bath and reading a book. Joining classes for meditation or yoga could be a great method for you but if you don’t have time for this then there are also many videos and tutorials for yoga online which you can watch from the comfort of your own home. Guided visualizations may also be a technique you would like to explore and Paul McKenna has an excellent series of self-help hypnosis books and CD’s which have great reviews and I can recommend these from personal experience. 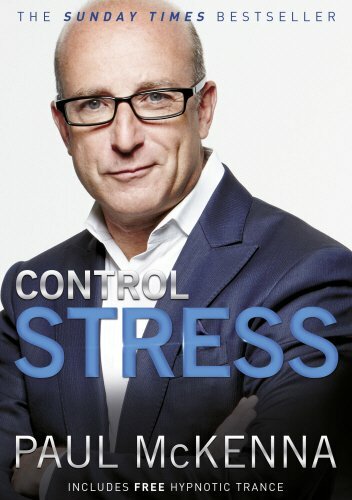 Control Stress Stop Worrying and Feel Good Now! To relieve tension and help sooth aching muscles, booking in for a soothing massage could really help to reduce your stress and cortisol levels. A massage can lower your blood pressure and slow your breathing and heart rate down. The aches and pains in your muscles can be instantly soothed away through a massage. So if you are under stress right now, a massage could be the option for you with immediate and long lasting results. It can be easier said than done, but turning off that laptop screen, phone and television can actually be better for your health and help reduce your stress levels. This is especially important in terms of you getting more sleep because these devices emit a blue light which actually inhibits your body’s natural production of the sleep hormone melatonin. So especially when it comes to the evening time, there is all the more reason to shut down that computer and turn off those screens! Instead, focus on having some enjoyable quality time with family or friends. From playing a board game, doing a jigsaw or arts and crafts projects together, or even simply having a good conversation, there are countless ways to switch off without using technology. Reducing your reliance on technology will hopefully open up new possibilities for you to de-stress. Of course it depends on the time of year and various commitments you may have, but often the highly stressed individual will struggle to say ‘no’ to people and projects or to possess the ability to switch off at all. Therefore, one of the best ways to achieve this is to remove yourself from your environment completely. Taking a holiday has long been recognised as one of the quickest and simplest ways to de-stress. Even if you can only manage a brief weekend break away, it can only do some good towards reducing your stress levels. Music has many therapeutic benefits for your health from slowing your heart rate down to lowering your blood pressure. If nothing else, music can provide you with a complete sense of escapism from the stresses and strains of everyday life. Going to a live concert or music event could have a stronger effect on you than listening at home on your own as it would become more of a social occasion. If you are already keen on listening to music to de-stress, then you may wish to take this enthusiasm one step further and learn an instrument. Natural remedies could also help to lower your stress levels. For example, St John’s wort is a natural flower which is used in the treatment of depression and anxiety. It is available in many forms from concentrated liquid to capsules. There are also various herbal remedies to help aid sleep, and this option may be worth exploring further if you are interested. However, before starting any courses of herbal or natural remedies always check in with a health professional first, especially if you are also on any long-term medications. Writing down your thoughts, worries and concerns is a great way to let out the burdens of the day. Theoretically speaking, once your thoughts are down on paper, you can then perceive them as being free from your mind. Lower your stress through writing your thoughts down and you will not only gain better and more restful sleep, you will also be able to improve your overall mental and physical sense of well being too. Animals have long been shown to have a calming influence on their owners, and studies have proven this amongst dog owners in particular. If you don’t own a pet or know anyone that does, then perhaps visiting a zoo could be a way for you to observe and interact with new animals from a safe distance. As even watching them in their natural environment could have a calming effect on the stresses you are feeling. I hope these 10 tips can go some way to helping you control and reduce your stress levels. Even if you are only able to incorporate one or two into your daily routine gradually, every little can help in the quest to lead a more relaxing and happier stress-free life. Relaxing should not be considered a luxury. It is a necessity! Being close to nature also helps. If someone cannot afford an actual holiday, a day trip or a short visits to the outskirts of town will make you feel so much better. I also loved your music!